The word "Person" is both one of the most important, and misunderstood words in our modern vocabulary. It is important because of the direct implications it has on day to day life, and misunderstood because of the different definitions that exists over certain lingo's, the most important those of Law and Politics. It is my belief that a better general understanding of this if fundamental in creating a fairer society. probably from Etruscan phersu, mask "
The reason? It all depends on the Language that is spoken. Counties and cities can be treated as a person in the same manner as a corporation. However, corporations, counties and cities cannot have the emotions of humans such as malice, and therefore are not liable for punitive damages. 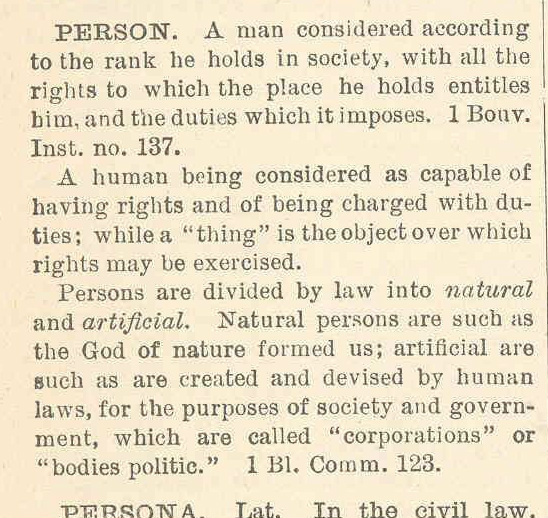 Natural Person: a real human being, as distinguished from a corporation which is often treated at law as a fictitious person. A Human Being is a person, and a Corporation is a person, but the Corporation is obviously not a Human Being? If the Definition of Person includes both the 'Corporation' and the 'Human Being', does that make a Human Being a Person? A Swan is a kind of bird. Is there for every bird a kind of Swan? Swans includes black and white birds. Is every white bird a Swan? A specific kind of Person (Natural) is a Human Being . Does that make a Human Being a kind of Person ? Black’s Law Dictionary is the definitive legal resource for lawyers, law students and laypeople alike. Black's Law Dictionary is known for its clear and precise legal definitions, substantive accuracy, and stylistic clarity — making it the most cited legal dictionary in print. Natural person: A natural person is a human being that has the capacity for rights and duties. Artificial person: A legal entity, not a human being, recognized as a person in law to whom certain legal rights and duties my be attached - e.g. a body corporate. Barron's Canadian Law Dictionary, 3rd edition. This makes it clear in a different way; The natural-person has the "capacity" (i.e. ability) for rights and duties, but not necessarily the obligation. The artificial-person has rights and duties that may be attached (i.e. assigned) by laws. Homo vocabulum est naturae; persona juris civilis; Man is a term of nature; person of civil law. Bouvier's Law Dictionary (1914), "Maxim" p. 2136.
" This word 'person' and its scope and bearing in the law, involving, as it does, legal fictions and also apparently [IN APPEARANCE ONLY] natural beings, it is difficult to understand; but it is absolutely necessary to grasp, at whatever cost, a true and proper understanding to the word in all the phases of its proper use. A person is here not a physical or individual person, but the status or condition with which he is invested. Not an individual or physical person, but the status, condition or character borne by physical persons. The law of persons is the law of status or condition. " Why is it so important we are aware of this? The status of 'person' ... is by consent! "Misera est servitus, ubi jus est vagum aut incertum." The word "Person" is what is called a "Legal Fiction"
legal fiction n. a presumption of fact assumed by a court for convenience, consistency, or to achieve justice. Constitutions, Bills of Rights, legal Documents. It is not so long ago that this knowledge was more in the open. The following was published in 1856. Although it shows that now we have a much more equal society, the same underlying principle is still here.